Beautiful cypress cabin located on a paved and peaceful road only minutes from Oxford, Ole Miss and Sardis and Enid lakes. Amenities include a large general sleeping area upstairs with two full bunk beds, a full bed in the master bedroom downstairs and a hide away bed in the living room. Kitchen has a stove, dishwasher, microwave and stackable washer & dryer. 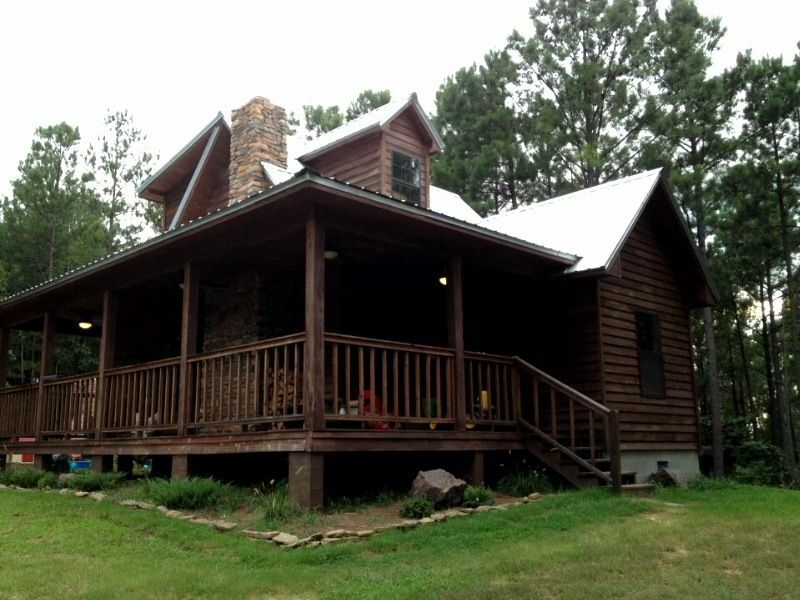 Cabin has large open & screened porches and a large indoor fireplace. The concrete patio outside has a large outdoor fireplace and charcoal grill. TV's, DVD player and DISH network are provided in living room and upstairs bedroom. Bathrooms have a walk in shower downstairs and claw foot bath tub upstairs. Cabin is ideal for weekend getaways, Ole Miss athletic and Oxford cultural events, family reunions and fishing trips. I am loan officer at a local bank. My wife and I graduated from Ole Miss and always wanted to come back and make it our home. We moved to Oxford 6 years ago with our two sons and absolutely love living here. We built this cabin as a weekend place in 2011 to be able to come and stay and enjoy Oxford and Ole Miss in a private and peaceful place that also allowed us to enjoy the outdoors. We found and purchased the land in Lafayette County first and then built the cabin to make it as enjoyable as possible for our family. Our guests will enjoy the peaceful and tranquil setting of the cabin along with the modern conveniences that come along with it. Most families and/or friends enjoy getting around the fireplaces together or being together on the porches. Grilling/smoking or cooking meals together and/or traveling to Oxford to enjoy any of the events or to watch the Rebels play is something everyone will enjoy. Kids always enjoy being in the outdoors vs. being in a hotel room and our cabin definitely provides that. toilet, shower, Limestone walk in shower in downstairs bathroom. Central air-conditioning throughout cabin as well as a extra window unit available upstairs. Central heating is provided throughout cabin. All beds have linens provided for them except for hide a bed couch in living room. Hide a bed provided in couch in living room. Recliner also provided. Paper towels, garbage bags and misc. food seasonings provided. Cooking utensils, silverware and dishes are also provided. Direct TV programming provided on all TV's. Upstairs bedroom TV has a DVD player also. Books are provided in book shelves. Open porch with rocking chairs and concrete patio with fireplace and table and chairs provided. No pets or firearms allowed on property. Guests must stay in the yard / grassy areas on the property. Access to the wooded areas is prohibited. All garbage must be bagged. No debris of any form may be thrown in fireplaces or left in yard including but not limited to bottle tops or cigarette butts. Great, peaceful place to stay! I would recommend this place for anyone looking to get away. Very peaceful. Nice place, secluded yet only minutes from the town and university. Every thing was exactly as promised, only wish we could have stayed longer! Great value, great location.... you can't go wrong with this one!! This is such a charming and cozy place. All of the beds are so comfortable. I slept so sound! The only thing that really needs an upgrade is the living room furniture so it will be comfy to enjoy that great fire place. Everything else is perfect! I will return! The cabin was awesome. My kids truly enjoyed staying in the cabin away from the suburbs. We even had 4 deer hanging out by the woods next to us. Both fireplaces were a huge hit with my "city boys". They kept a fire going the entire time we were there. The cabin is also in good proximity to local national park and the city of Oxford for quick field trips. Already planning another trip in a few months. It was a perfect place for a weekend getaway for my family of 5. Ole Miss / Oxford athletic and cultural events. Grenada Lake and Enid Lake and Sardis Lake are also only 30 minutes away.